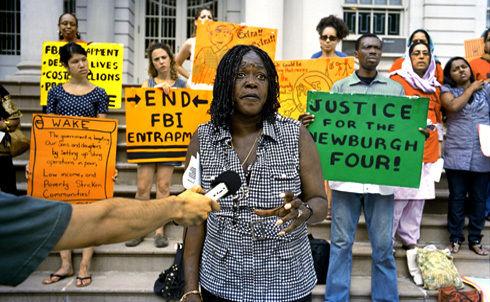 Slide Show: Were The Newburgh Four Victims of FBI Entrapment? On October 18, 2010, a federal jury convicted David Williams IV, James Cromitie, Onta Williams and Laguerre Payen on charges of conspiring to fire missiles at military planes and of attempting to blow up a synagogue and a Jewish Center in the Bronx. 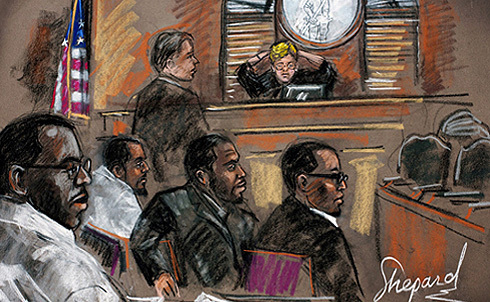 The group, who became known as the Newburgh Four after their arrest on May 20, 2009, staunchly maintains that they were entrapped by FBI informant Shahed Hussain and would not have conceived, let alone executed, their plot without his encouragement, inducements and guidance. Hussain, a Pakistani national who collaborated with the government to avoid being deported for an illegal scheme involving driver’s licenses, had served as an informant in a previous case in which defense lawyers claimed their clients had been entrapped. 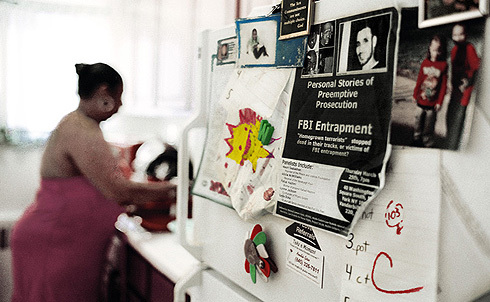 Alicia McWilliams-McCollum, aunt of defendant David Williams IV, has publicly characterized the FBI’s case against the Newburgh Four as entrapment. The Newburgh Four is one group among many, including the Liberty City Seven, the Fort Dix Five, The Albany Mosque Plot and the Detroit Ummah Conspiracy, in which FBI informants initiated and facilitated the development of violent plots of questionable legitimacy or threat. This banner was sponsored by Project S.A.L.A.M. (Support and Legal Advocacy for Muslims), one of the few organizations to provide support for families affected by FBI entrapment. Elizabeth McWilliams, mother of David Williams IV, believes that David was targeted by the FBI informant because he is Muslim and prayed at Masjid al-Ikhlas mosque in Newburgh, New York. 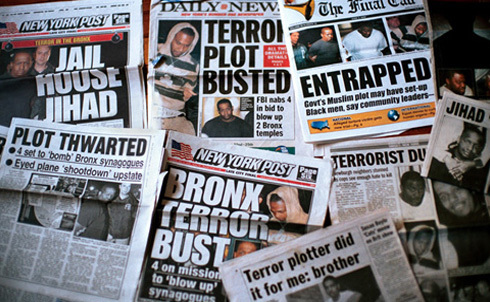 The Newburgh Four—three of whom, James Cromitie Onta Williams and David Williams IV, are African American, and one of whom, Laguerre Payen, is a black citizen of Haiti—were characterized as home-grown terrorists in mainstream media coverage of their trial despite the fact that, in May, prosecutors said the men were not associated with any terrorist group. Instead, the charges of which the Four were convicted ranged from conspiracy to use weapons of mass destruction within the United States to conspiracy to kill officers and employees of the United States. 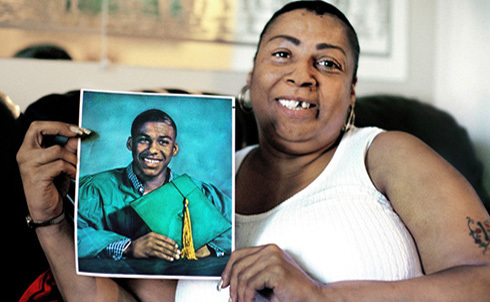 David Williams IV never graduated from high school and failed his GED test by 1 point. Prior to meeting the FBI’s informant, David was enrolled in a program to begin his college education. Newburgh, New York, with a population of 29,000, leads New York state in the number of violent crimes per capita. There are few opportunities for young people in Newburgh—the city lacks recreational centers, job training facilities and re-entry programs for ex-offenders. This made the Newburgh Four vulnerable targets for the FBI’s informant, who in 2007 started driving around Newburgh in a Mercedes, a Hummer and a BMW, flashing money and offering jobs to members of the Masjid al-Ikhlas mosque. David Williams IV considered himself to be "his brother’s keeper" and says he agreed to act as lookout in a plot to bomb a synagogue and Jewish Center in the Bronx and to shoot down military planes in exchange for money to pay for Lord’s rising medical costs. Lord had a nine pound tumor removed from his spleen and, prior to David’s arrest, was in a fragile medical state. The family lacked funds to pay for necessary medical treatments, and FBI informant Hussain assured David: "Don’t worry my brother, I’m going to help you." The informant met James Cromitie at Masjid al-Ikhlas in 2008, began monitoring him, and promised Cromitie $250,000 to finance a bombing plot. James recruited David Williams, Onta Williams and Laguerre Payen to participate as lookouts in the plot, and the informant offered each man $5,000 to participate. The Newburgh Four knew each other for only two weeks prior to their arrest on May 20, 2009. 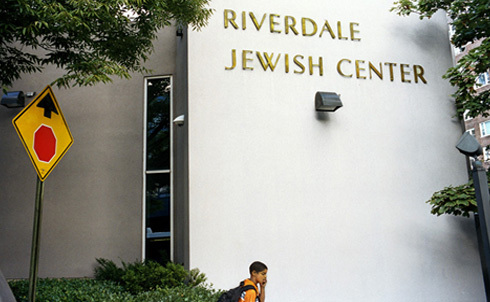 A student passes by the location where, on May 20, 2009, James Cromitie and FBI informant Shahed Hussain placed three inert explosive devices in a Mazda parked outside the Riverdale Jewish Center. The dummy bombs, composed of C-4, steel ball bearings and a timing device, were manufactured in an FBI lab and provided, through the informant, to the Newburgh Four. Hussain testified on September 8 that, once he and the Newburgh 4 arrived in Riverdale, he took complete control of the operation, as advised by FBI Supervisory Special Agent Robert Fuller. Though each of the Newburgh Four had previously been incarcerated, no man had ever been arrested for, or convicted of, a violent crime. Laguerre Payen, a Haitian national, has a 10 year history of mental illness and schizophrenia, and it remains unclear whether he was able to comprehend the plot. David Williams IV, as was shown in FBI recordings presented at trial, was hesitant to carry out the plot during the day, stating, "What I’m saying is there could be people there. You don’t want to hurt nobody." From 2007-2009 the FBI monitored the Masjid al-Ikhlas mosque and eventually sent Shahed Hussain to infiltrate the community as a paid informant. Hussain earned $100,000 in cash wages and expenses as an informant, including $23,000 to prepare for and testify at the Newburgh Four trial. 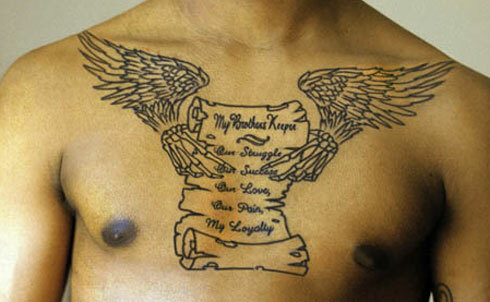 In trial testimony on September 16, 2010, Hussain revealed, "I like the work I do. I enjoy the work I do. That’s why I do it." 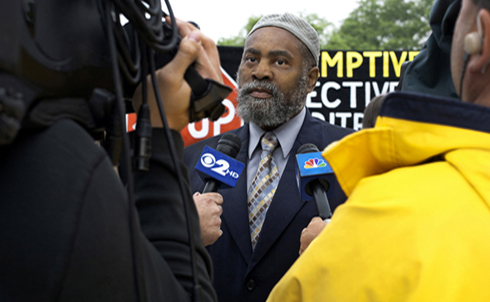 The Masjid al-Ikhlas mosque’s Imam Muhammad was the first person to publicly define the Newburgh Four case as entrapment. Had the Newburgh Four not met Shahed Hussain, in Muhammad’s words, "these men would still be smoking weed and drinking beer somewhere." 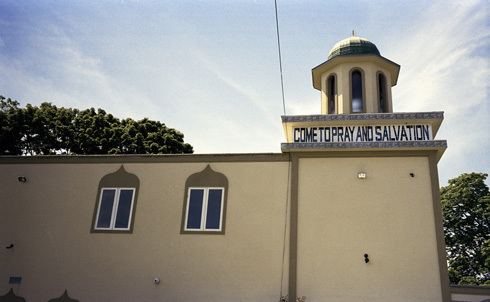 Documents revealed during the Newburgh Four trial show that the FBI considered Imam Salahuddin Muhammad and other members of the mosque to be persons of interest. Imam Salahuddin Muhammad was awarded the 2010 Human Rights Award by Orange County officials, in recognition of his community engagement and work as a chaplain to Muslim inmates in the New York State Correctional System. David Williams IV’s aunt, Alicia McWilliams-McCollum, has publicly denounced the FBI’s use of informants and agent provocateurs in targeting Muslim and impoverished communities. This rally, which Alicia organized, was located on the same stairs where, two days after the Newburgh Four arrests, New York City Mayor Michael Bloomberg passed out awards to law enforcement officials involved in the case. Alicia McWilliams-McCollum demands that these awards be returned, as they were given out when the Newburgh Four were under the legal presumption of innocence. The Newburgh Four are scheduled to be sentenced, by Judge Colleen McMahon, March 24, 2011. In regards to the Newburgh Four, Judge McMahon noted, during a pre-trial hearing on May 28, 2010, "I have referred to the case for a number of months, in the privacy of my chambers, as the un-terrorism case." 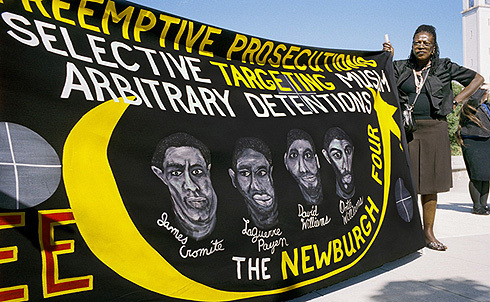 The families of the Newburgh Four staunchly maintain that they were entrapped, and on October 22, 2010, there was a rally in Newburgh in support of the defendants. The family of David Williams IV has contacted the White House and seeks to hold the Justice Department accountable for the FBI’s use of criminal informants.